We lost our lovely girl Tammy to a sudden and lethal bout of Pancreatitis 2 weeks ago. Just 5 years old. We are devastated. She was a rescue who had a hard life before she came to us, and for her to be taken like this seems particularly cruel. A loving, timid, and much missed friend. However in our 4 years with her we learnt the value of true unconditional love, and she was treated every day of her short life as a Princess. RIP our little beauty. 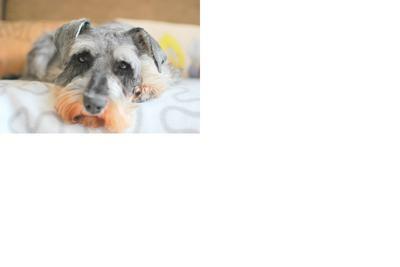 Yes, better to wait a little while and then look for a new Mini Schnauzer with a clear head. Although no dog will ever replace Tammy, good luck in your search for a new companion. Thanks for your kind words, I'm sure we will be busy looking for another mini Schnauzer once the shock from Tammy's passing has eased! so sorry to hear about Tammy- I have two minis and would be devastated if one went but sounds like she had a lovely life with you. Hopefully you can find the time at some point for another one or two? So sorry to hear of Tammy's passing. She looks like such a character. It sounds like she had a wonderful life with you and spent her last four years in happiness. Well done to you for rescuing her, Tammy was lucky to find you and we hope you will remember all the happy times together.